Former Aldine football coach Bill Smith was honored Saturday as a member of the Class of 2012 Gridiron Legends. The designation recognizes those who have made “a significant contribution to the game of football in the state of Texas” at the high school or college level, according to the Meineke Car Care Bowl of Texas website. Smith led the Mustangs to state and national championships in 1990, a perfect season and 273 wins during his career, the fifth most of all time among Texas Class 5A coaches, according to an Aldine press release. In 2004, one year after his retirement, Aldine renamed its stadium after coach Smith to honor his contributions to football and the school. Other members of the Class of 2012 include: 1990 Heisman Trophy winner Ty Detmer and College Football Hall of Fame coaches Darrell Royal, the winningest coach in Texas Longhorns football history, and Hayden Fry, former head coach at the Iowa, North Texas and Southern Methodist University. Smith will be inducted during the 2012 bowl game on Dec. 28 at Reliant Stadium. For 33 years, Irene Hopkins dedicated herself to the students and athletes at Nimitz High School serving as a teacher and coach at the Aldine ISD school. She started the softball program at the school and served as its only head coach until her retirement in December of 2011. She was one of the most respected softball coaches in the Houston-area during her tenure and cherished teaching the sport she loved to the many players that passed through the program over the last 33 years. Although she is no longer a part of the program, her name will forever be linked to the softball program at Nimitz High School and in the district as well thanks to action taken by the Aldine ISD Board of Trustees at their July 17 Board meeting. On that night, Aldines Trustees unanimously voted to rename the softball field at Nimitz High School after Irene Hopkins and in addition, the districts annual Varsity Invitational Softball Tournament will also bear her name beginning with the 2013 event. Hopkins, who served as a teacher and coach for 43 years in Aldine, began her teaching/coaching career in 1969 at Aldine Junior High (now Aldine Middle School). She transferred to Nimitz High School in 1978 and was part of the original staff that opened the building. When she retired, she was the last original member of the staff that opened the school in 1978. She was known among her peers as a pioneer and when she retired she was the longest serving coach in the history of Aldine ISD. Irene not only shared her knowledge of the game with her players, but she also gave of her personnel time and resources to keep the softball field at Nimitz in the best condition possible for her teams to play and practice on. As a matter of fact, she loved coaching so much that for the first seven years of her tenure, she volunteered as the teams coach without pay. In addition to coaching softball, Irene also coached basketball, track and volleyball and served as a health teacher. Nimitz High principal Alex Jordan, who worked with Irene for more than 20 years, said she was most deserving of the honor the Aldine Board bestowed upon her during their July meeting. “I can’t think of a more deserving person for such a wonderful honor,” Jordan said. “It has been a pleasure to be a colleague of Irene for more than 20 years. She embodies all of the characteristics that professional educators should possess. During her 33 years at Nimitz High, many of her former students and players received scholarships and went on to become coaches themselves. Her peers honored her during the 2008-09 school year when they voted her Nimitz Highs Teacher of the Year. The recommendation to rename the softball field at Nimitz High was made by Trustee Steve Mead, who chairs the Boards school names committee. He was joined on the committee by fellow Trustees Dr. Viola M. Garcia and Rose Avalos. 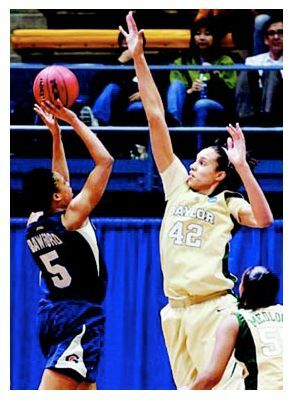 On Nov. 11, 2008 Nimitz Highs Brittney Griner blocked 25 shots against Alief Hasting, setting a national high school record. Last week she added another notch to her six-shooter, blocking an NCAA-record 14 shots to help the Number 4 seed Baylor Bears defeat the Number 5 seed Georgetown Hoyas 49-33 in the second round of the national tournament. She also holds the NCAA single-season record with 199 blocked shots. Griner shattered the previous single-game record of 11 set in 1989 by UNLVs Pauline Jordan. What is remarkable is how the 68 freshman broke the record. Finding herself in foul trouble early, Griner had limited playing time in the first half with just seven minutes on the court and recording just one block. Then in the second half, she exploded for 13 more blocks. At one point Griner held the Hoyas to more than 10 minutes of play without making a point, forcing 15 missed shots. The Hoyas were shutdown by Griner who possesses an 88 wingspan (thats 74). Most people have a wingspan (or length of arm and fingertip to fingertip of the other side) equal to their height. In the victory, Griner blocked more shots than Georgetown had baskets for the game. Griner also scored seven points and had seven rebounds in 27 minutes of play. The win over Georgetown positioned Baylor for a Sweet 16 match-up with Tennessee, who is ranked the Number 1 seed in the tournament. While the two schools have not played very often, their meetings have been memorable. Tennessee was one of the universities that heavily recruited Griner. However, it was Baylor who Griner made a verbal commitment to back when she was a junior and when signing time came her senior year she made good on that commitment. Tennessee got some revenge on losing the player selected by USA Today as the National High School Player of the Year by beating Baylor in their season opener 74-65. If Baylor can hold off the Volunteers to advance to the Elite 8 the school can avenge a Sweet 16 loss to Tennessee in 2004. Griner has also become an Internet superstar with viral videos showing her ability to dunk the ball. She is only the second woman in NCAA history to dunk the ball twice in one game. Lionell Crawford is living a dream, and enjoying every minute of it! Crawford, a 1988 graduate of Aldine High School and the football team’s star quarterback under the tutelage of legendary head coach Bill Smith, returned to his alma mater in February when he was named the school’s head football coach. Although he and his new staff were a bit behind in their 19-5A rivals in terms of implementing their offseason program, they knew they had enough talent on hand to make a run at the playoffs once the 2009 season rolled around in August, and right they were. The Mustangs closed the season with a kick and qualified for the playoffs. They defeated Westside 28-19 in bi-district play before falling to Alief Taylor, 38-35, in a thrilling second-round game. 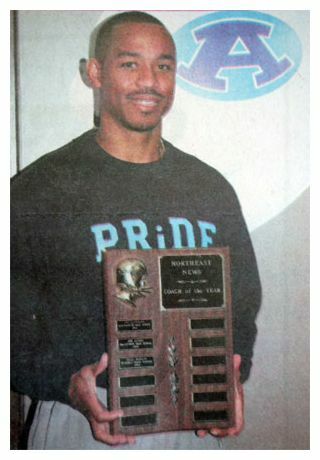 By leading the Mustangs to a playoff win and a 7-5 season, Crawford was named the Northeast News’ Coach of the Year for the 2009 season. 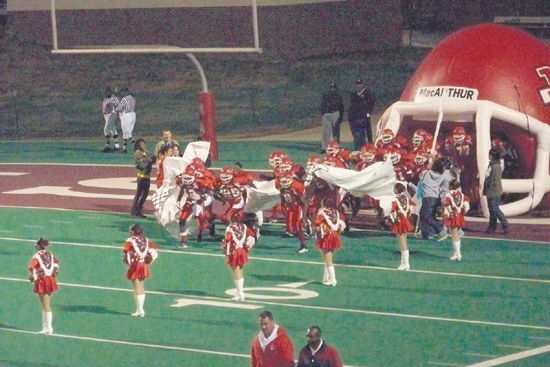 The Aldine job is Crawford’s second head coaching stint. Prior to landing at the helm of the Mustangs’ program, Crawford was the head coach at Smiley High School and then North Forest High (Smiley and Forest Brook combined and the school was named North Forest High in 2008), where he led the Bulldogs to a 6-4 season in 2008 and a playoff berth. 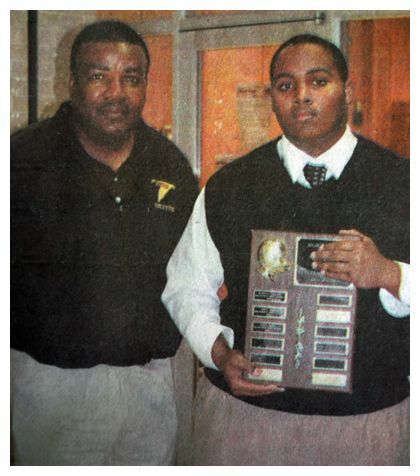 Before becoming a coach, Crawford was a strong football player himself. After graduating from Aldine, Crawford earned a football scholarship to the University of Wisconsin, where he played quarter back and wide receiver for Barry Alvarez. After two years with the Green Bay Packers, Crawford entered the private sector. He began his coaching and teaching career in 2000. Like Smith before him, Crawford hopes to spend many, many years as the Mustangs’ head coach. Some would say Lionell Crawford is off to a good start in reaching that goal. Jay Guy is an impressive young man, on and off the football field. When he’s on the football field, Guy is a one-man wrecking crew, but off it, he’s a loving and caring individual who cherishes giving back to his fellow man. The 6-0, 300-pounder was a three-year started for the Eisenhower High football team and helped lead them to the playoffs three consecutive years. As a senior, Guy recorded 75 tackles, recovered 6 fumbles, and came up with 7 sacks. He was named first team all district by the District 19-5A head coaches two years running and was the 2009 Defensive Player of the Year in 19-5A. His solid senior season also earned him the distinction of being the Northeast News’ Defensive Player of the Year. Guy, who will enroll at the University of Nebraska in January, is also a top-notch student. He is ranked 29th out of 580 fellow seniors and is in the top five percent of his class. He serves as vice president of the student council and volunteers at his church. Eisenhower High head football coach Ray Evans has seen a lot of talented players in his 30-plus years as a coach and he says Guy is perhaps the best he’s ever coached. When Evans coached at Lamar High School, he had the good fortune to coach Cedric Jones, who later went onto the University of Oklahoma and in 1996 was the fifth overall pick in the NFL draft. Evans said Guy is even better than Jones. Guy was recruited by Cal, Stanford, Notre Dame, Michigan, LSU, and a number of Big 12 schools, but he chose Nebraska because he was impressed with the defensive scheme run by the Cornhuskers under the direction of head coach Bo Pellini. He also likes the fact that Husker players are expected to contribute in the community as well. “Their players visit hospitals and things like that. That impressed me. I’m looking forward to contributing to the community as well,” said the soft-spoken senior. One thing he’s not looking forward to are those Nebraska winters. He’s also looking forward to following in the footsteps of defensive tackle Nhamukong Suh, who is considered the best defensive player of the last decade in college football. It’s that time of year again, time for the annual Red River Rivalry, and once again, this one means a lot to both the Texas Longhorns and Oklahoma Sooners. A win by Mack Brown’s team puts them squarely in control of the Big 12 South Division and solidifies their chances of not only playing for the Big 12 title the first Saturday in December, but for a spot in the BCS title game in January. For Bob Stoops’ Sooners, a win would make their season and take some of the sting out of a season that has seen the team decimated by injuries to key personnel, which has resulted in them playing the role of spoiler instead of national title contender. Before we take a look at that game and a host of others, let’s review last week’s record. A 7-5 mark brought the season record to 30-26 (54 percent). 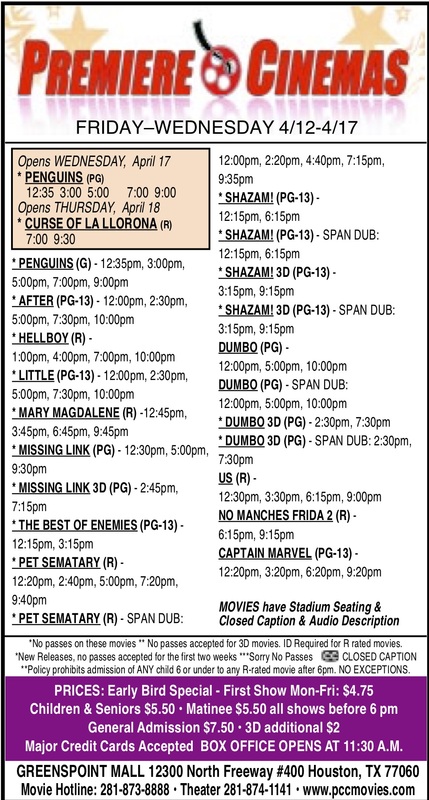 Now, onto this week’s games. Denver at San Diego: Don’t look now, but the Broncos are a pretty good football team. When the season began, most experts expected Denver to struggle this year considering they traded their stud QB Jay Cutler and first-year head coach Josh McDaniel pretty much revamped the roster. Four weeks into the season, the Broncos have one of the top defenses in the league (just ask the Cowboys), a steady quarterback in Kyle Orton and a talented rookie running back in Knoshown Moreno.